Strange bow hold. Can be a pinky problem? I like it. You are doing very well. You have good intonation and dynamics. Your bowing arm is working well, you have good posture. What you need to do now is just keep practicing, you are doing great. Great bowing and intonation. Not much to fault except that it lacked 'feeling'. How do you put it there I can't really they'll you. I'm having problems like that myself at this time. Or am I having a 'terminology' problem? So OK. Let's just say that 'I' would have played that piece with my index finger very much closer to the pegbox. I 'am' 60+ after all. Very good intonation ... just two or three quick notes sounded like they may have been off a little bit. So that is a very big plus. It sounded like you broke the rhythm in a few places, at the ends of phrases near 0:14, 0:30, 0:45, and 1:02. SOTCD is usually played with a strong regular beat. Tapping and counting along with a metronome or with any regular beat can bring a big improvement very quickly for one's sense of rhythm. Nice form on the left: straight wrist, good hand and finger position. Bow hold looks somewhat unusual. Are you able to use the whole bow? Disuse of the pinky might make it hard to bow near the frog. Good work ... happy to have you with us. I've had an accident in my right side of the body and I mis half of the pinky, so I do not think it gets better with the right hand. Just download a metrome app for my phone and I will try to play with it in the ear. You're welcome. Sorry to hear about your accident. Oh, I see you're putting your third finger atop the stick instead of the fourth. Meanwhile your first finger touches the stick near the middle knuckle or between the middle knuckle and the end knuckle. So I would call that an adaptation of the Franco-Belgian hold. You might look systematically at the "Russian" bow hold if you haven't yet. That might be the best one to adapt to your needs. The first finger would contact the stick between the base knuckle and the middle knuckle. I don't want to upset your form if you're sure you're making the best of it. I'm just giving that idea in case it is new to you. Good grief, John. Playing with your index finger closer to the nut would put you totally out of tune, providing all other fingers hit their correct notes. 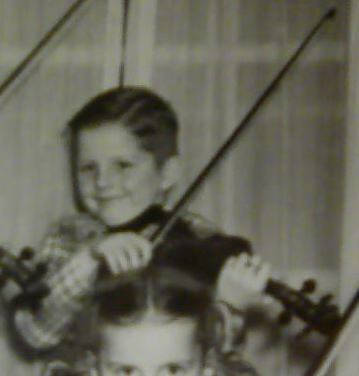 Fiddlestix / Ken,,,<< 71 next month. Thank you for your suggestion. I will try it. Nothing wrong with playing over the fingerboard a bit. it gives a softer tone which is sometimes desirable. You seemed to use the right bow pressure to get a clean sound. It could use a bit more accenting and emotion. Listen to a few recordings and make note of the feeling of the music. Otherwise I think you played it good. Sound good to me. Hello There.. you just zipped that off. Woo hoo!!! You got it man! I play it a bit slower because I am tempo challenged.. but that is one of my favs in my "songs in the bag" list. Meaning I can play if asked.